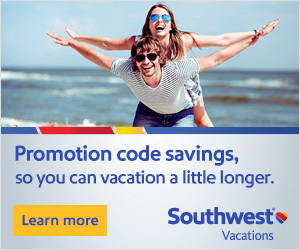 We just recently returned from our 4th time in a row to Roatan, Honduras and I had one big request for this trip. A visit to Daniel Johnson’s Monkey and Sloth hangout. I wanted to hold a sloth SO bad. And my dream came true. It was such an awesome experience. Just about how I felt when we swam with Omar, the sea lion at Coral World in St. Thomas, Virgin Islands. 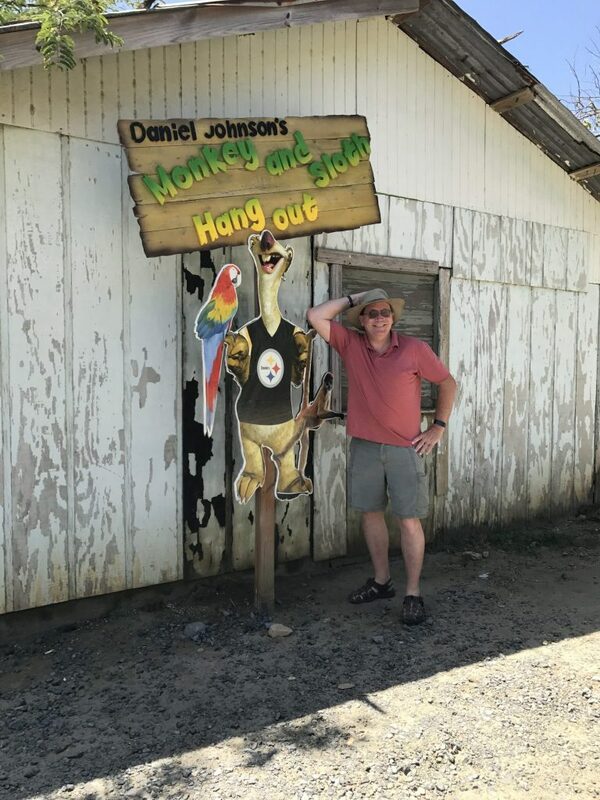 Daniel Johnson’s Monkey and Sloth Hangout is in French Cay, Honduras on the island of Roatan. We were picked up in West Bay by one of their drivers. She was awesome and made the 45-minute drive to the hangout fun. We stay on West Bay Beach but walked up to Java Vine coffee shop in West Bay to make it easier for pickup. I had reached out via Facebook a few days in advance to see if we could visit the hangout and they were very accommodating. It doesn’t hurt that we travel to Roatan in the offseason. It wasn’t busy at all. I think there was only one other couple there. When we arrived we paid the $10/per person fee to enter and was given a fun tour guide. 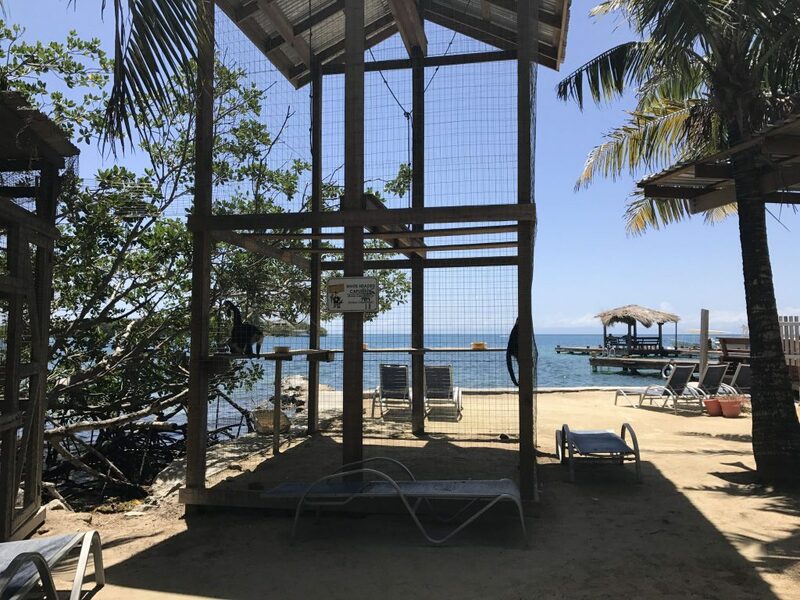 There are quite a few different animals at the hangout like a white-nosed coati, raccoon, agouti (that’s Roatan’s rabbit) spider monkey’s, macaws and more. When we entered the animal habitat we were also greeted with a stunning view of the sea. There are lounge chairs on a small beach area for relaxing too if you want. 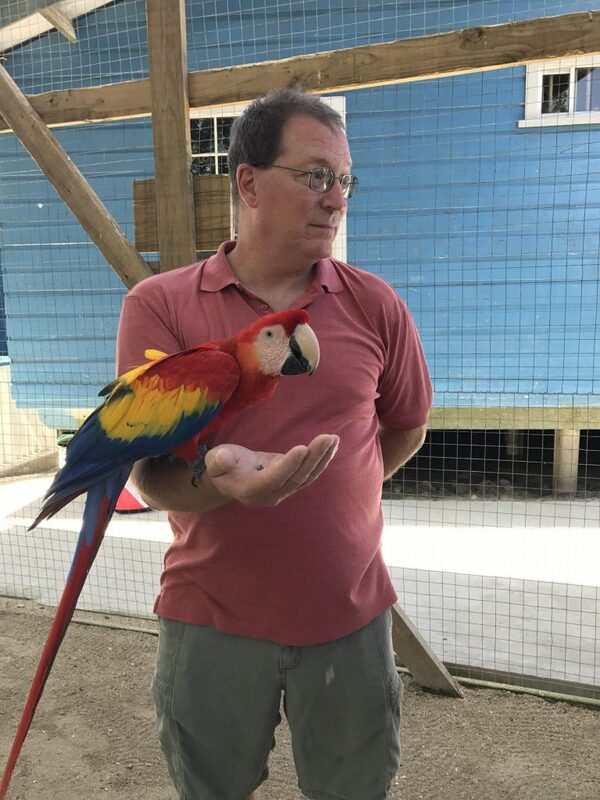 Here’s Kev holding one of the macaws at the sanctuary. We have a Blue and Gold Macaw at home so these cuties were familiar to us. 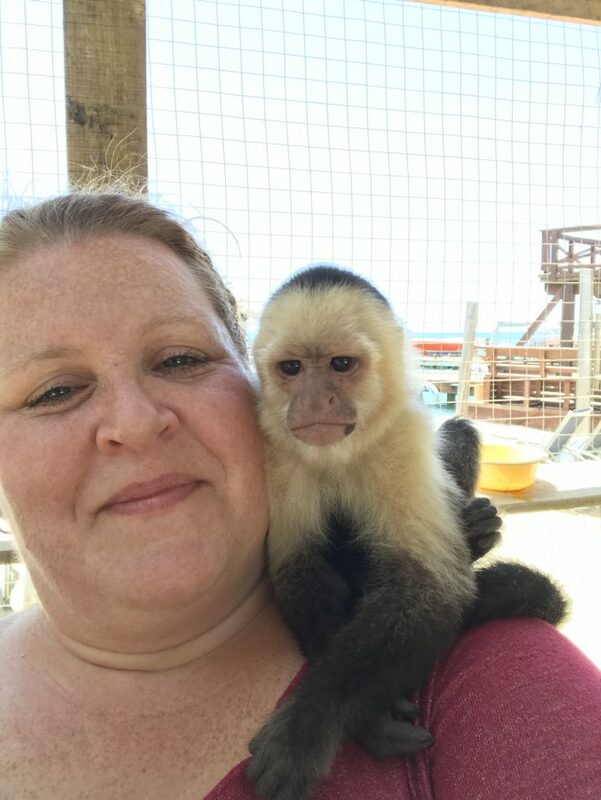 We have held monkeys before in Roatan at Gumbalimba Park so I was excited to interact with them here too. Here’s my monkey pal. Just chillin. We have a lot more pictures that I’ll have to capture in a video. Plus more videos to go through. The day was everything I expected and more. The Hangout (an animal sanctuary/habitat) is not huge by any means but it’s just right and I love that they take in these animals and care for them. It was on the top of my wishlist to get to Daniel Johnson’s Monkey and Sloth hangout and hold a sloth. I’m just so thankful we got to go. It was the highlight of this trip. Here’s the little female baby sloth loving on Kev as he watched the crazy monkies we were about to go play with. 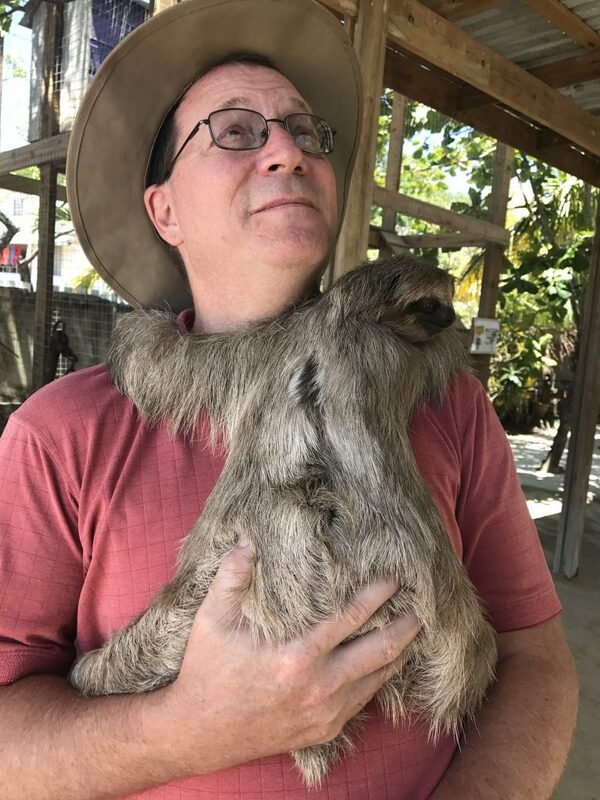 If you love animals and ever get to Roatan, Honduras try to plan a visit to Daniel Johnson’s Monkey and Sloth Hangout. Highly recommended. We would go again. Have you ever held a sloth? Have you been to Roatan? I use a wheel chair, will I be able to visit the monkey and sloth sanctuary ?